Leslie Young, Anna Mehler Paperny, Francis Silvaggio, and a production team from GlobalNews.ca have just compiled and published the most comprehensive chronology of Alberta oil spills, spanning a period from 1975 to 2013. Following an eleven-month investigation, the reporters acquired a nearly complete set of records regarding spills of crude oil, crude bitumen, and synthetic crude in the province of Alberta for the past thirty-seven years. The data came from Alberta Environment and Sustainable Resource Development and the Energy Resources Conservation Board (ERCB), revealing the spill volume, location, cause of spill, and facility operator for each spill incident. This map plots the number of oil spills on pipelines and other facilities regulated by the Energy Resources Conservation Board between 1975 and 2013. It is searchable by company and by cause. Unfortunately, the data on this map is not sortable and it cannot be extracted easily for further analysis. This map shows the volume, location, operator, and cause of all oil spills in Alberta on pipelines and other facilities regulated by the Energy Resources Conservation Board. It includes a tool to search by location. Again, this map has its limits. For some reason, users cannot zoom out fully to see the entire map of Alberta. It also does not permit users to extract the data for analysis. In spite of the inability to analyze this data with more detail, this report is outstanding. It comprehensively uncovers the chronology of oil spills in Alberta history in staggering detail and provides excellent context and analysis of the contemporary regulations that govern the industry. This work now calls for historians to chart the findings on a timeline, analyze the data, and explain the context for this important period of Canadian economic and environmental history. Such analysis of historical data is necessary for assessing the potential risks associated with future oil pipeline construction. 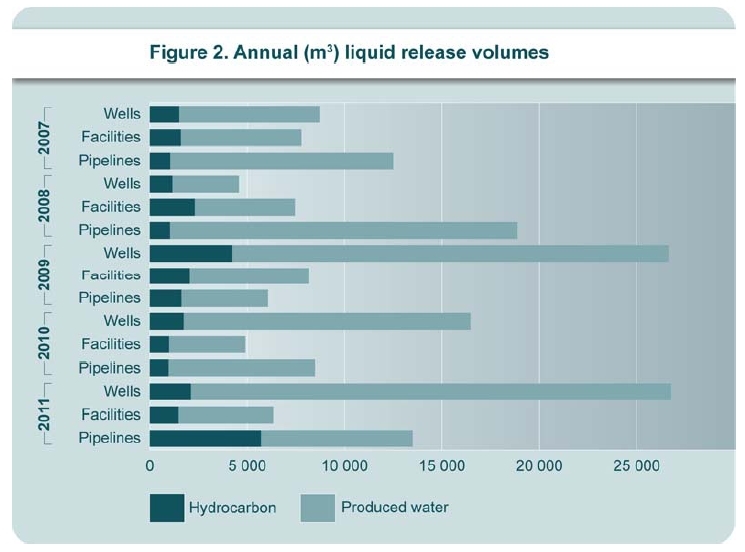 The most recent field surveillance summary report from ERCB indicates that liquid hydrocarbon spills on pipelines and other oil facilities continues to be a problem in the province of Alberta. In 2011, more than 5 million litres of liquid hydrocarbons spilled on the provincial oil pipeline network. According to ERCB data in this report, the volume of oil spills has been variable from year to year, spiking in certain years as a result of particular catastrophic oil spills, such as the 2011 spill near Little Buffalo. Hopefully, the complete set of oil spill records from ERCB will be made publicly available online so that researchers can analyze the complete timeline of this important historical period. Thanks for reading my article. I’m glad to see that someone shared the link. Amazing what your research found on the oil industries mess ups…Most people walk around with their heads in the sand..money was more important in the past than the environment.Lets hope information like yours makes people aware and helps shut down the dirty oil business. Thanks for reading this article. I hope you have the chance to read some of my other articles on the history of oil pipeline line development in Canada. Absolutely dreadful. I am a Norwegian citizen, and even though Statoil as a Norwegian company is more responsible than most of the others, I still think it is shameful to find Statoil in such horrid, dirty company. If it had not been for you, Kheraj, I would not have known about their oil spill. Because they of course do not talk about it. Thank you! I’m glad you found my research to be useful. Indeed, I too have been surprised to learn how regularly these pipelines spill oil.